Written in non-technical language, this book will help every Canadian small business person make effective use of eBay to increase their sales to domestic and foreign markets. It covers issues specific to Canadians (unlike most other books which are written for Americans). Selling on eBay is probably one of the easiest ways to test new products and sell-off excess inventory or end-of-line goods, yet many Canadian businesspeople do not know how to go about it. This book will provide them with the basic knowledge to get started with a very small investment. This book shows readers how to conduct their own research, determine their offering prices, list their products and create great images. They will learn about consignment selling and selling wholesale lots. It shows them how to get paid and how to deliver products domestically, to the USA and internationally together with the issues they will face. It shows readers how to provide excellent customer service and the importance of positive customer feedback. It offers suggestions on resolving disputes with buyers. This book discusses the importance of the "About Me" page and what is involved in starting an eBay store. In addition, readers will learn how to set up their own e-commerce Web site and use eBay to help drive traffic to it. It shows how to make the Web site user-friendly and how to improve rankings with search engines. It covers the effectiveness of banner ads, pop-up ads, Web rings and the importance of links to other sites. Readers will also learn how to keep the name of their business in front of customers with permission-based e-mail and e-newsletters plus the significance of viral marketing and the importance of referrals and affiliate programs. Finally, this book lays out the planning process to expand sales and the concept of multi-channel marketing. by using eBay and other channels. It discusses ways to integrate online activities with an existing business. It cautions readers about potential conflicts that may arise and offers suggestions on how to tackle them. It covers profit margins and talks about how much money businesses can reasonably be expected to make. Web marketing using eBay is a great way to expand an already established small business. This book provides Canadian readers with all the information they need to get started and where to obtain further information and advice. Chapter 1 - An eBay Primer: What Can You Sell? 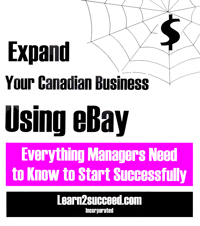 Expand Your Canadian Business Using eBay: Everything Managers Need to Know to Start Successfully by: Learn2succeed.com Incorporated; 226 pages, ISBN 978-1-55270-328-1 softcover, published in 2008; $34.95.